In fact the games were a triumph. And for the individual athletes the sheer joy and adrenaline of competing internationally overrode any earlier doubts about the venue. 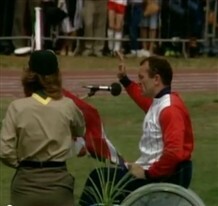 John Harris was selected from the home team to read the athletes' oath at the opening ceremony. "It was a fantastic honour, only one competitor from the host team gets to do it at the opening ceremony and I was picked. 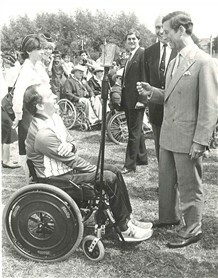 I am not still not quite sure why – possibly because I was Welsh and the games were opened by the Prince of Wales. Maybe I had just achieved a certain ‘notoriety’ within the British team as a loud-mouthed Welshman. Anyway, I got to do it. They gave it me on a sheet of paper and I had learnt it by heart in a couple of hours. There I was wheeling myself up to the stage to make the oath in front of the crowd and I still had the sheet of paper on my lap. I remember thinking, ‘I don’t need this’ and crumpling it up and throwing it away and then I went up and delivered it word perfect." 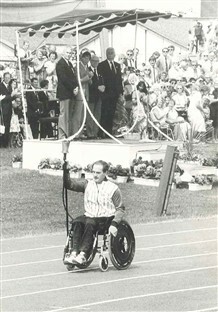 Terry Willett was selected from the British team to light the Olympic flame at the stadium. 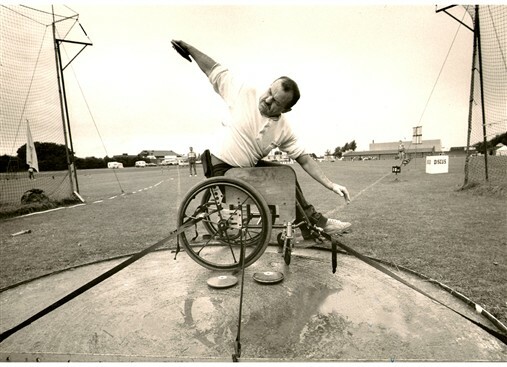 He was a former British team captain: a fencer who had already won gold and silver at the Toronto and Arnhem 'paralympics'. 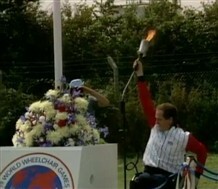 He was fitted out with a gas bottle in his side pocket and a pipe running up his arm inside his tracksuit to feed the torch.
" 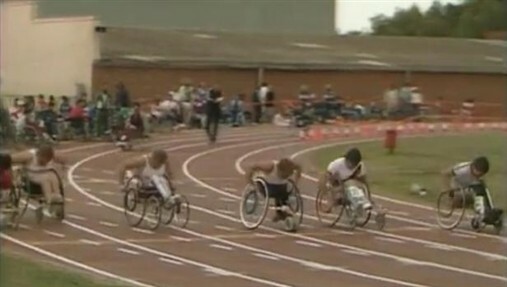 I had to go a good distance, round the track and then over to the far corner of the sports field to light the flame; and you can’t use a wheelchair one-handed and make it go in a straight line. So I came up with this idea of mounting the torch on a four foot metal pole that was welded to one of the front wheel castors on my chair. So by turning the pole I could simultaneously hold up the torch and steer my chair, propelling myself along with the other arm." "The Olympic flame was a large bowl over in the far corner of the sports field. Under the base of the bowl there was a man crouching down underneath the frame with a ruddy great gas bottle. I could see him, but he was hidden from all the dignitaries and the crowd. So I came up in the chair with the torch and he said, “When you’re ready Terry”, and I held up the torch and he turned on the gas and that was it: Olympic flame lit; it burned for the entire week of the games." "I can remember wheeling myself over from the school we were staying in, crapping myself; it was so scary. There were five or six guys there I had never beaten before. 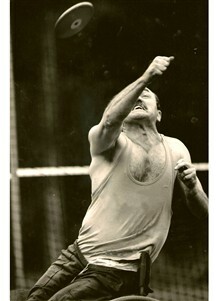 First round I threw really badly and at the beginning of the second I was lying fifth out of six. My first throw that round went straight out of the sector but my second went 28.5 metres and that was probably going to be good enough for the Bronze. 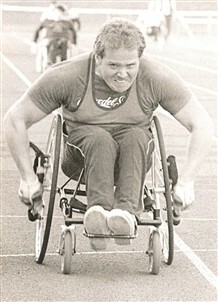 John won the gold in discus; Mike in swimming and Paul competed in the 100 metres, marathon and relays. Read the full interviews with them below.